In a recent post that focused on Bassem and Nariman Tamimi’s cynical exploitation of their children as props for their efforts to provoke clashes with the IDF in order to ignite a “Third Intifada,” I noted that the Tamimis can usually rely on completely uncritical and indeed outright sympathetic media coverage of their activism. The most striking example of the cozy relationship that the Tamimis have cultivated with the media is perhaps the fawning tribute featured as a New York Times Magazine cover in March 2013, which was authored by American writer Ben Ehrenreich after he had been a house guest of the Tamimis for three weeks. It is thus hardly surprising that by now, the Tamimis apparently feel free to tell the media any story that suits their purpose. Their complete disregard for facts and the ease with which they fabricate a story to bolster their image as righteous defenders of a noble cause was on full display in the wake of the widely covered recent attempt of an IDF soldier to arrest Bassem Tamimi’s 12-year-old son Mohammad (also known as Abu Yazan) for stone-throwing. As the viral video-clip showed, the fully armed soldier was beaten and bitten by a group consisting mostly of women and girls – prominently including Bassem Tamimi’s daughter Ahed – and the soldier ultimately released the boy from his hold and retreated. One element that undeniably added to the emotional impact of the clip was the fact that Mohammad Tamimi had a plaster cast on his left arm. The various explanations offered by Bassem and Nariman Tamimi about how their son sustained the injury that required the cast reveal their mendacious modus operandi and their reliance on uncritical and sympathetic media coverage. 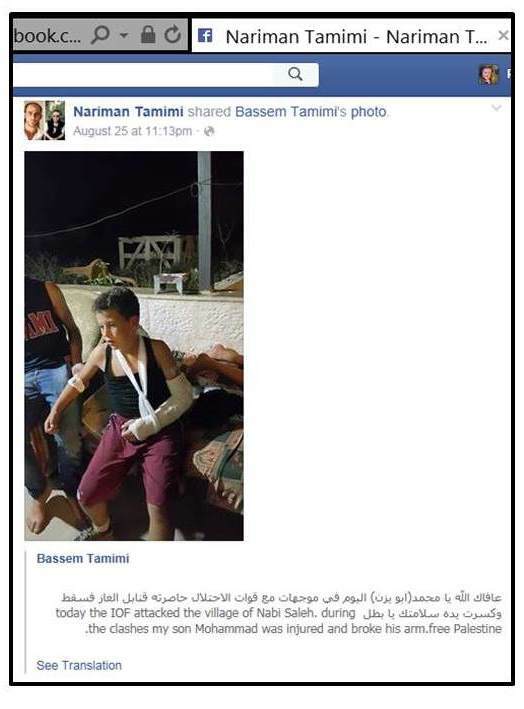 Before documenting the fabrications of Bassem and Nariman Tamimi in detail, it is noteworthy that their son’s previously injured arm not only added to the impact of the viral clip that showed an ostensibly frightened boy with one arm in a cast, but that it also greatly intensified the sense of victory felt afterwards by the family and their supporters. As the saying goes: one picture is worth a thousand words – and this widely shared picture with which the Tamimis celebrated their “victory” transforms the frightened and injured boy who was exhibited to the world as the victim of a brutal assault by a heavily armed soldier into a little superman who needs just one arm to toss the hapless soldier into the air. As far as the Tamimis are concerned, it truly is child’s play to “shatter the myth of the Zionist army.” Needless to say, if the “Zionist army” was as brutal and trigger-happy as the Tamimis usually claim, their “heroic” son would have had two broken arms in the best-case scenario. Apparently, the journalist did not notice that it would be rather unusual if the IDF drove a “tank” through the village and children would have to ‘flee’ this tank. It seems that the journalist did not question the claim and no evidence is offered to support it. Again, no further evidence of the alleged attack on the Tamimi’s home is provided. So did Mohammad Tamimi break his arm while fleeing an Israeli tank, as his father claims, or did he break his arm while sitting peacefully at home, getting hurt by tear gas canisters shot into the Tamimi house by the IDF, as his mother claims? 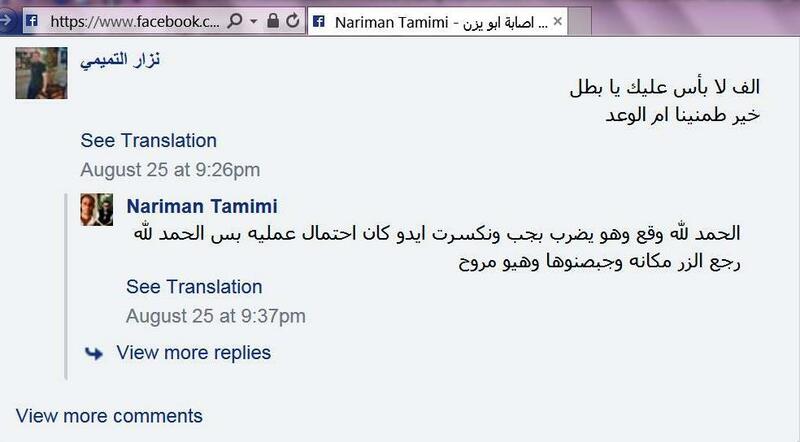 The answer suggested by checking the relevant Facebook (FB) posts of Bassem and Nariman Tamimi is: none of the above. 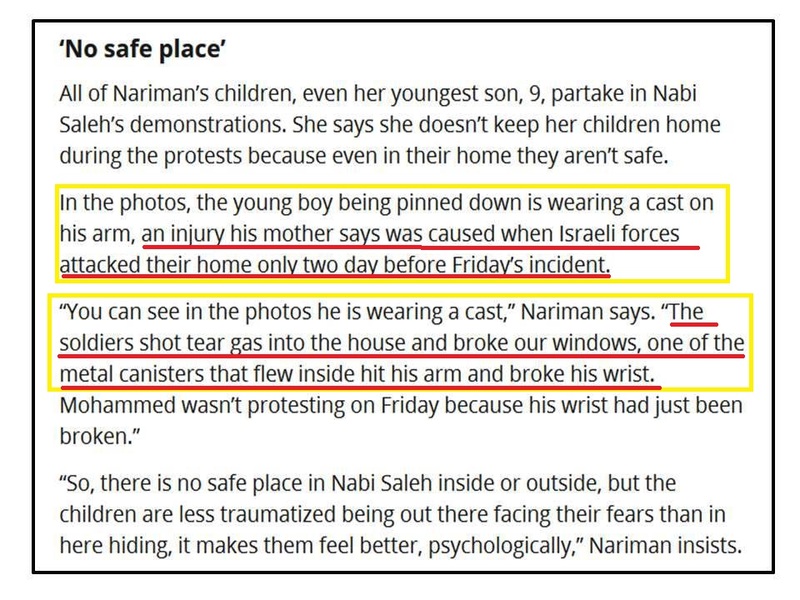 Nariman Tamimi’s story appears to be a complete fabrication, invented at the spur of the moment to justify why she would not only allow, but actually encourage even her youngest child to participate in regular protests that are designed to provoke clashes with IDF soldiers. 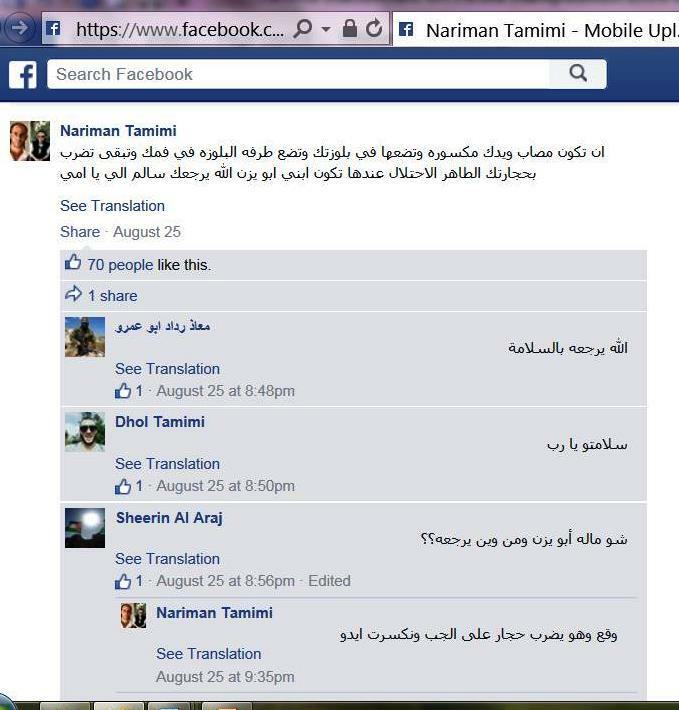 About an hour later, at 8.46 PM, Nariman Tamimi posted a follow-up, including a photo, via mobile upload on her FB page. 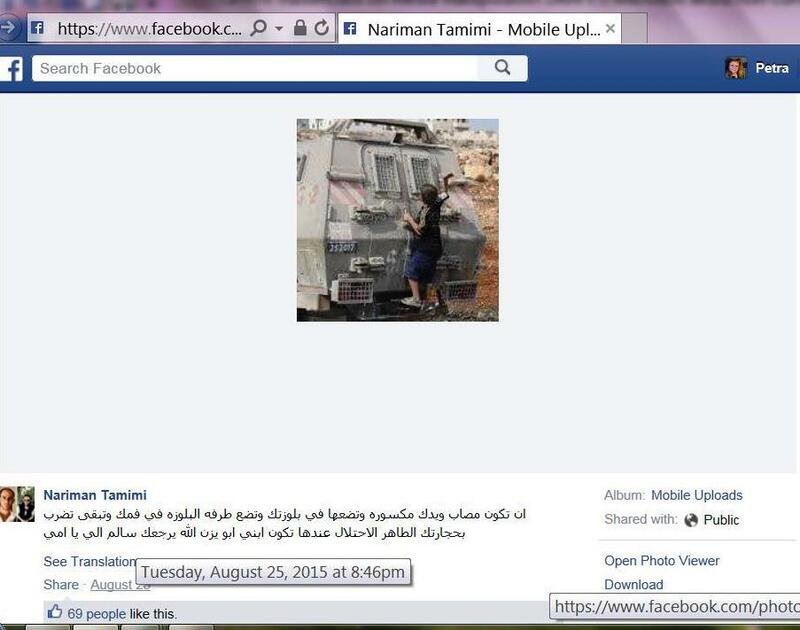 The message Nariman Tamimi has for her son here is clear: never mind that you broke your arm while throwing stones at an army jeep, pull yourself together and keep throwing stones. This is a truly chilling glimpse of the ruthless pressure the Tamimis exert on their children. 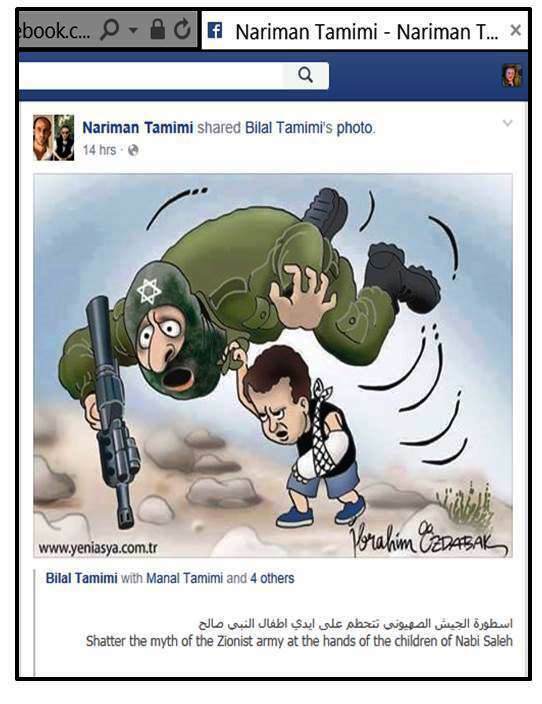 Nariman Tamimi shared this post on her own timeline at 11.13 PM. Bassem Tamimi’s version was of course vague enough to allow both of them to fill in details and dramatize as needed when they were asked a few days later how their son had broken his arm. Bassem Tamimi chose to come up with the frightening scenario of a tank ploughing through the village, forcing his son to flee in panic; whereas his wife felt the need to invent the very different scenario of an IDF attack on the house, because she wanted to justify her insistence that it was best for her children to be sent out to confront soldiers. Both obviously counted on the credulity of the reporters and didn’t expect to be asked for any evidence. Their son had a cast on his arm – who would doubt that in some way or other, a vicious act of the brutal “IOF” was to blame? How often have the Tamimis played the same game without being caught lying? And make no mistake: the “victory” for which the Tamimis are fighting is not the peaceful co-existence of the Jewish State of Israel and an Arab-Muslim Palestinian state. In various interviews published on sites that oppose Israel’s existence as a Jewish state – such as the “hate-site” Mondoweiss and The Electronic Intifada (from where an interview conducted by the notorious Max Blumenthal was even cross-posted on the website of the Al-Qassam Brigades), Bassem Tamimi has indicated that he is a determined proponent of the so-called “one-state-solution” that would absorb the world’s only Jewish state into yet another Arab-Muslim majority state. 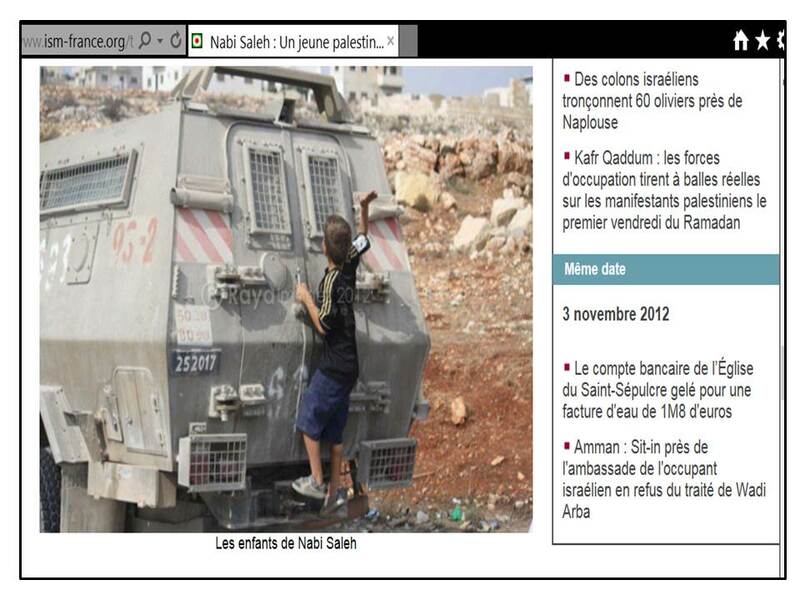 This is a slightly edited version, including additional screenshots, of the piece recently published on my JPost blog.